It’s understandable if you’ve never heard of the USS Liberty and the more than 200 sailors who were wounded and lost their lives the day she was attacked in the summer of 1967. That was the Summer of Love, when nearly 100,000 American youth descended on Haight Ashbury in San Francisco, and the Vietnam War was really getting into the ugly abyss it would become. Nearly 13,000 American’s died in the jungle in 1967, less than half the number who would fall in 1968. So, it’s understandable if amid all that carnage, loss, and revolution the lives of a couple hundred Liberty sailors fell to the heap of history and were forgotten. What’s still not understandable is why the Liberty was ambushed by Israeli gunships, that efforts to rescue dying sailors were called off, and a massive cover-up trailed the incident’s wake. Elizabeth Flock at U.S. News reminds us of the incident in a piece honouring this Friday’s Liberty memorial service to be held at Arlington National Cemetery in D.C.
Public DomainUSS Liberty (AGTR-5) at La Valletta, Malta, after arriving for repair of damages received when she was attacked by Israeli forces off the Sinai Peninsula on 8 June 1967. She arrived at Malta on 14 June. 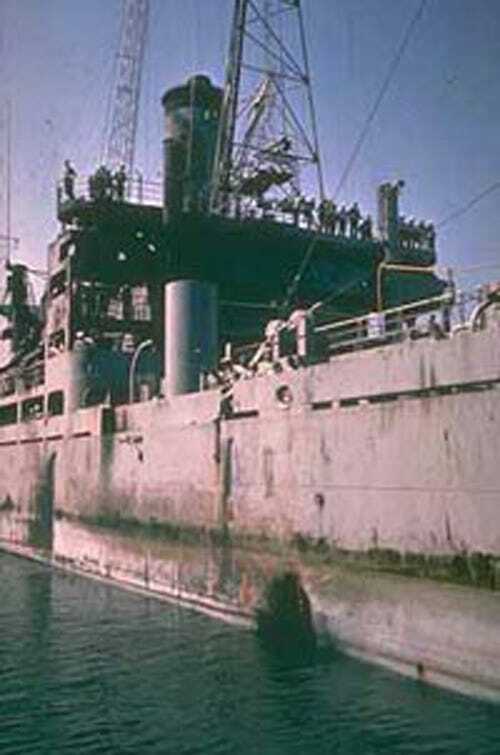 Note torpedo hole in her hull side, forward of the superstructure. Three days into Israel’s Six-Day War, the Liberty was parked off the coast of Egypt collecting communication signals in international waters. While initially some concern was given to the ship’s getting too close to shore, or mistaken for an enemy vessel, those misgivings seem to have vanished when Israeli planes flew in for a visual inspection at about 6:00 a.m. local time — as the mist was still burning off the surface of the Mediterranean. American sailors say the Israeli aircraft flew so close to the Liberty that they rattled the its steel plating while the ship’s crew waved to the planes pilots, who did the same in return. 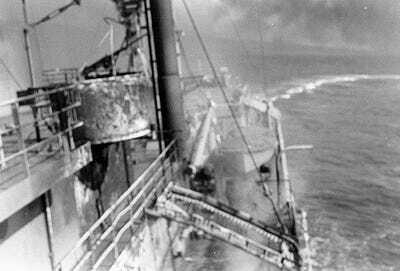 All morning and into the afternoon, the Liberty went about her mission unmolested when at 1:40 p.m., unknown to the Liberty crew, an Israel torpedo boat reported an “unknown vessel” travelling at speeds only attributable to warships. Twenty minutes later a pair of Mirage II fighters rattled down over the Liberty and made two visual inspection passes at 3,000 feet. The Mirage pilots radioed command that the ship looked like a non-Israeli destroyer, and orders came back over the airwaves to attack. The Liberty’s command knew the planes were Israeli so the ship’s crew were all on “stand down” mode, non-defensive, with no helmets or even life jackets at the ready. The twin Mirage’s pounded the Liberty with all the cannons, rockets, and bombs at their disposal during three separate runs. When they depleted their ammunition they were replaced by two Dassault Mysteres filled with napalm bombs that tore into the Liberty, engulfing it in a raging inferno from the bridge to the deck. When it was all over 34 sailors were dead, 174 were injured and Israel claimed they’d mistaken America’s most distinctive ship for an Egyptian horse-cavalry transport half the Liberty’s size with a completely different profile. Public DomainUSS Liberty (AGTR-5) receives assistance from units of the Sixth Fleet, after she was attacked and seriously damaged by Israeli forces off the Sinai Peninsula on 8 June 1967. An SH-3 helicopter is near her bow. A letter to Congress from USS Liberty veterans, asking for the renewed investigation, also says that rescue efforts to save the Liberty’s crew were somehow called off, and that makes even less sense to them than anything else about the whole, tragic, and nearly forgotten fiasco. The most detailed version of the incident and all that followed may be found here in the NSA’s de-classified documents.